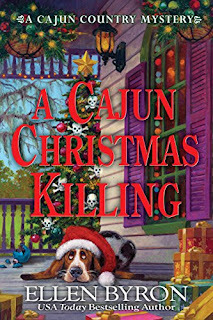 A Cajun Christmas Killing is a cozy mystery set in a small town in Louisiana. 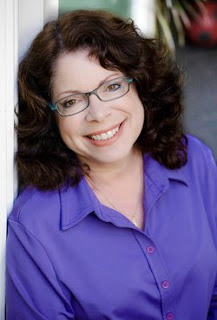 Maggie Crozat is an artist who has left her life in New York to help out at her family's bed and breakfast. When one of the B&B guests is discovered murdered, Maggie works to solve the crime ... especially because her boyfriend, police detective Bo Durand, is a suspect. 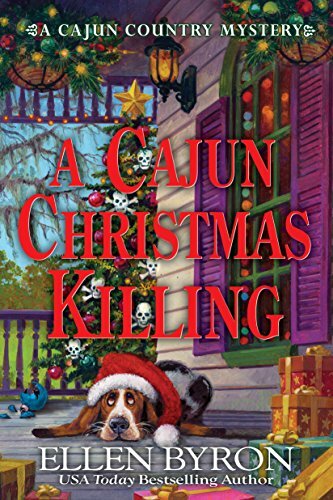 This is my first read in the Cajun Country Mystery series and it was really enjoyable. It worked as a stand alone, but I now want to look for the other books in this series and catch up! I loved the Cajun country atmosphere. I have spent time in Louisiana and loved it, and the author, Ellen Byron, really captured the area's charm so well. I also liked the Christmas setting and the descriptions of decorations and festivities. Anyone who enjoys Christmas mysteries will like this as well. As a bonus, there were even a few dogs in this book (which always makes a mystery better!) -- basset hound Gopher, rescued stray dog Jolie (and her puppies), and a tiny little dog named King Cake. I liked the character of Maggie. I enjoyed "meeting" her family and friends in the book, and liked the way she worked with Bo's relative Rufus to solve the mystery. I also liked the slow-building relationship between Maggie and Bo. 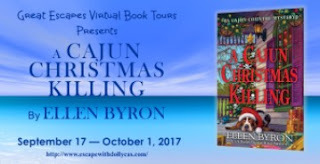 I recommend A Cajun Christmas Killing to fans of cozy mysteries, Christmas mysteries, and atmospheric southern mysteries. This book is perfect for a leisurely weekend read! Thank you for the book synopsis and review. I can't wait to read A Cajun Killing!